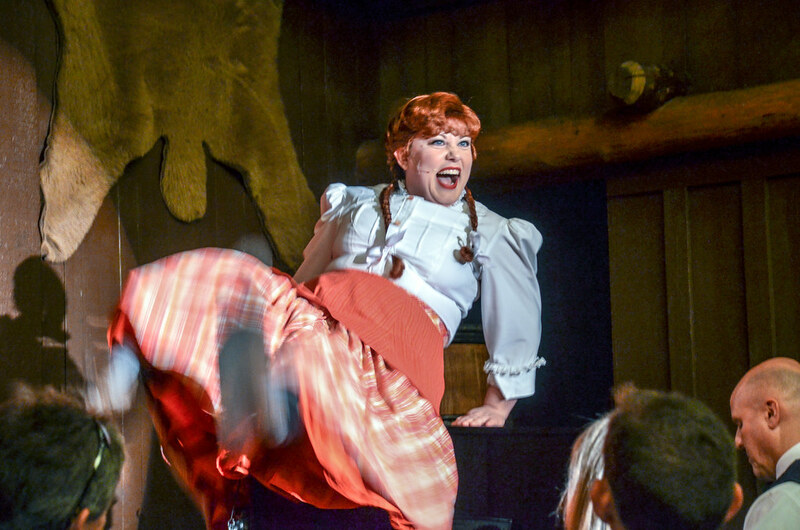 The Hoop-Dee-Doo Musical Revue is a dinner show at Fort Wilderness Campground & Resort. 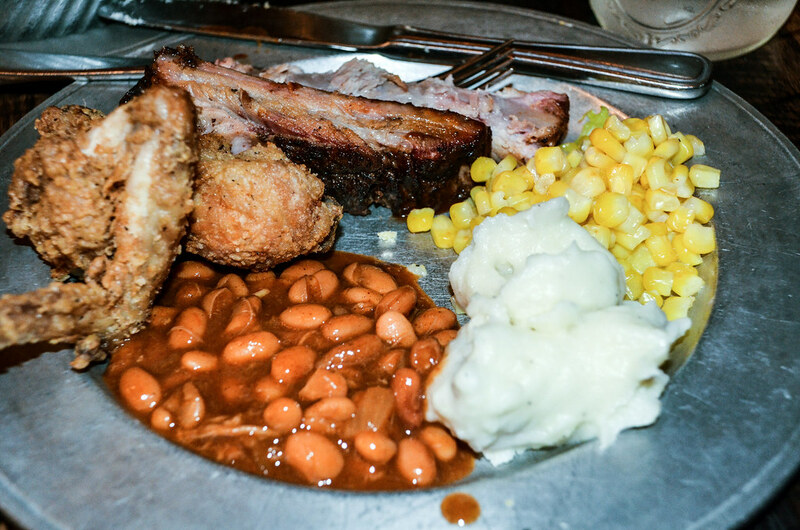 The food offered is traditional southern and BBQ food and is all-you-can-eat. The Hoop-Dee-Doo doesn’t accept an Annual Pass discount but does accept Tables in Wonderland. 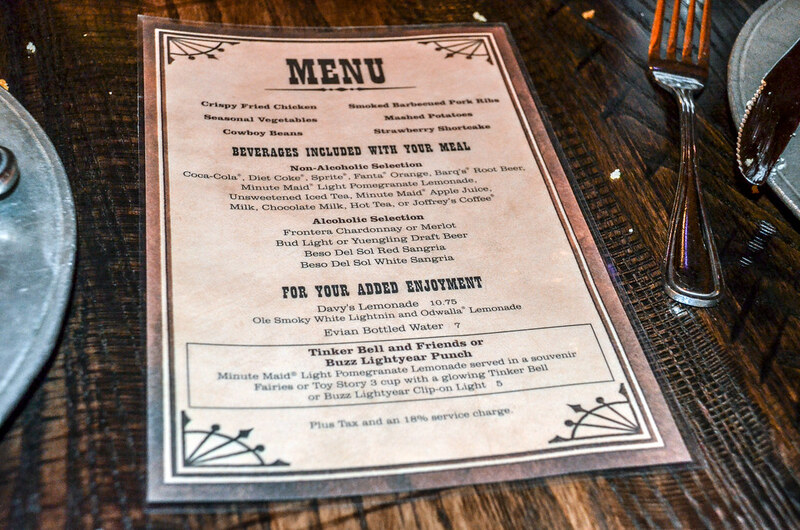 The dinner show is also a part of the Disney Dining Plan but counts as two credits. We recently dined here and this review will cover that experience. 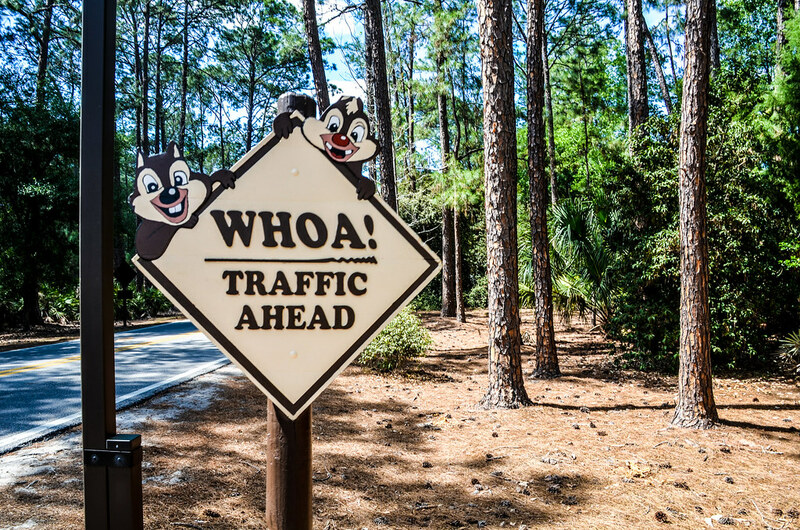 Getting to the Hoop-Dee-Doo (or any dining location) at Fort Wilderness is different from going to a restaurant at almost every other Disney World Resort. 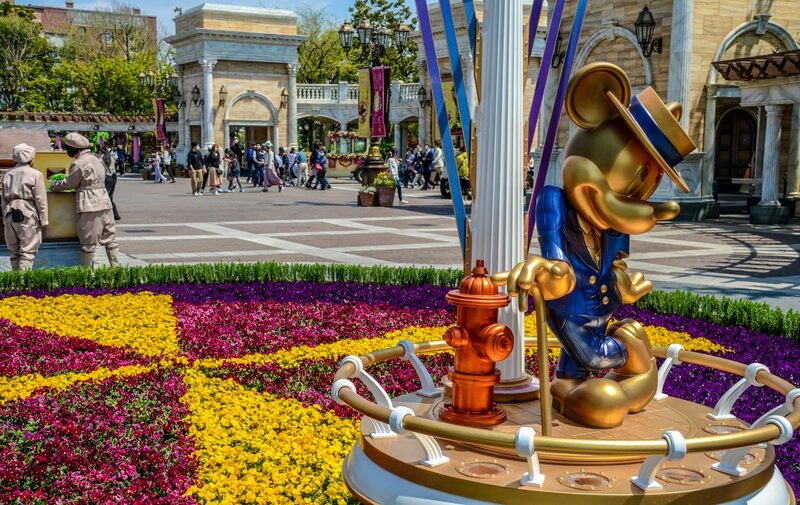 If arriving by bus from a theme park, then just hop on one of the internal buses and wait until you get to the stop for Pioneer Hall. If memory serves, this is about a 10-minute ride. You can also walk from where the bus drops you off and that takes a good 20 minutes. We did that and while the walk was pleasant, I wouldn’t recommend it if you are going to be rushed. Another way to get to the Hoop-Dee-Doo is to go to Magic Kingdom (or if you’re already there just go out the entrance) and catch a boat. This can also be done at the Contemporary Resort. 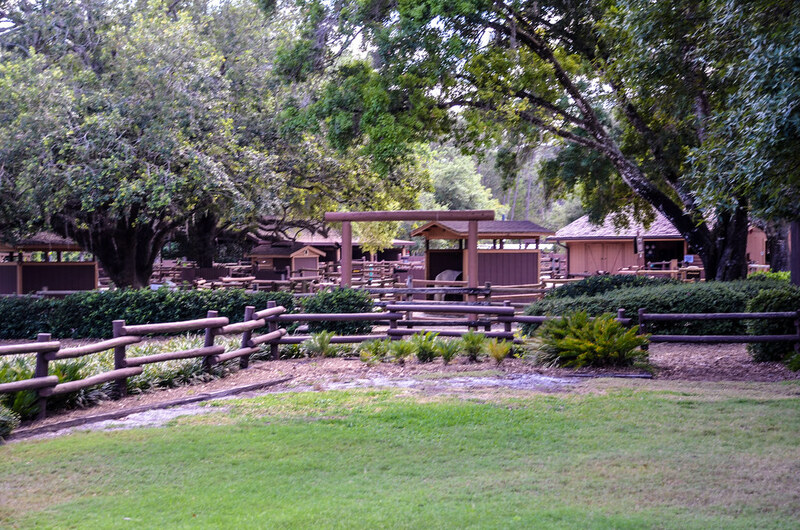 The boat will dock a short walk away from Pioneer Hall, which houses Hoop-Dee-Doo. Once there, guests check in at a window or the front door. 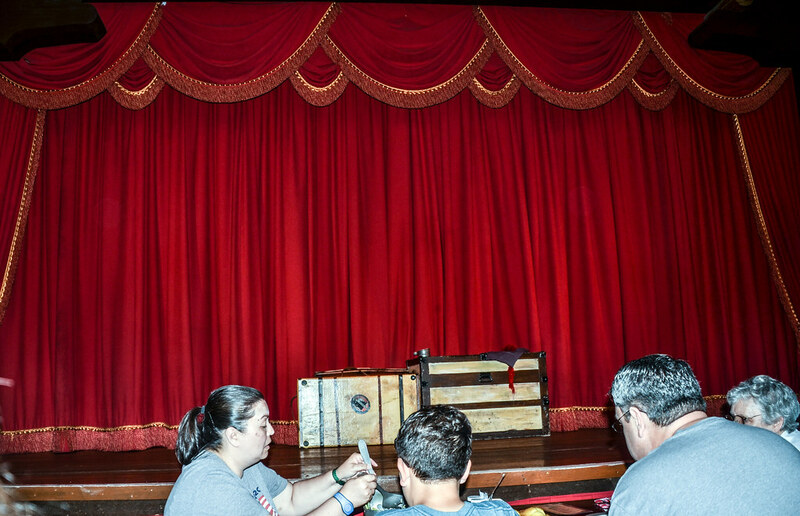 Like most restaurants at WDW, it’s smart to book the Hoop-Dee-Doo well in advance. There are typically 3 showings a night at 4, 6:15, and 8:30. The dinner lasts just under 2 hours. All in all, the experience takes a decent chunk out of your day. That’s not to say that it isn’t worth it though. 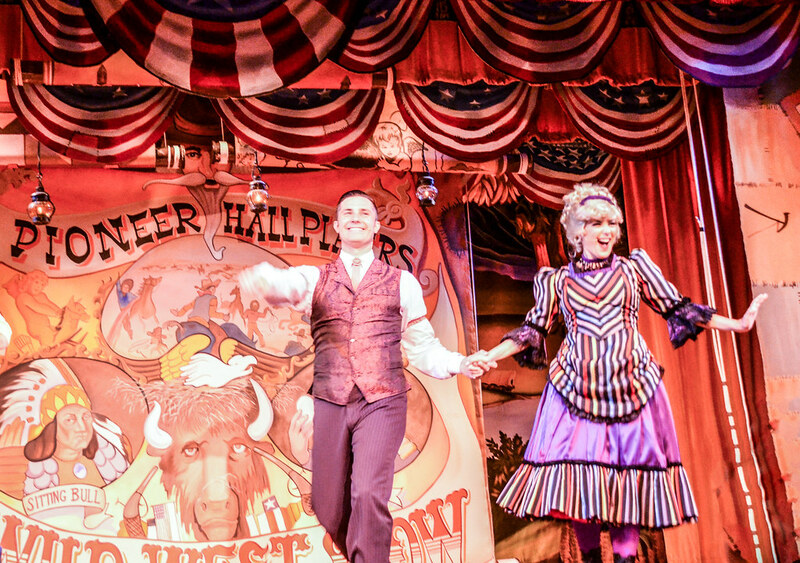 If I only had one word to describe the Hoop-Dee-Doo Musical Revue it would simply be ‘fun’. From the moment you step into the building it is hard not to be charmed. 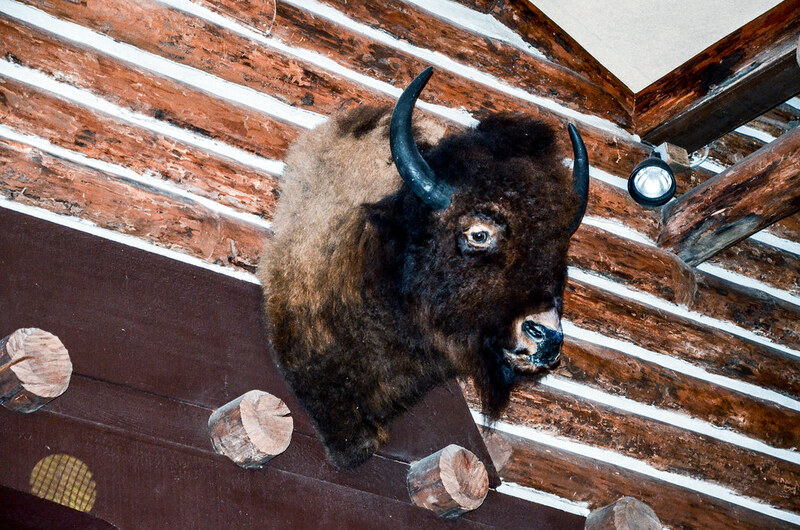 Pioneer Hall fits the theme of Fort Wilderness well. It feels like an old mess hall that everyone would gather at for dinner. That’s not to say it isn’t pretty. It’s just pretty in an old western way. There are a few stuffed animal heads on the wall and flowers around the seating area. There are different seating options, mainly the floor or the second level. There aren’t many tables up on the second level but the views aren’t nearly as good. I would recommend the bottom floor unless you want to be more secluded. I have a hard time imagining the experience being better from up there though. 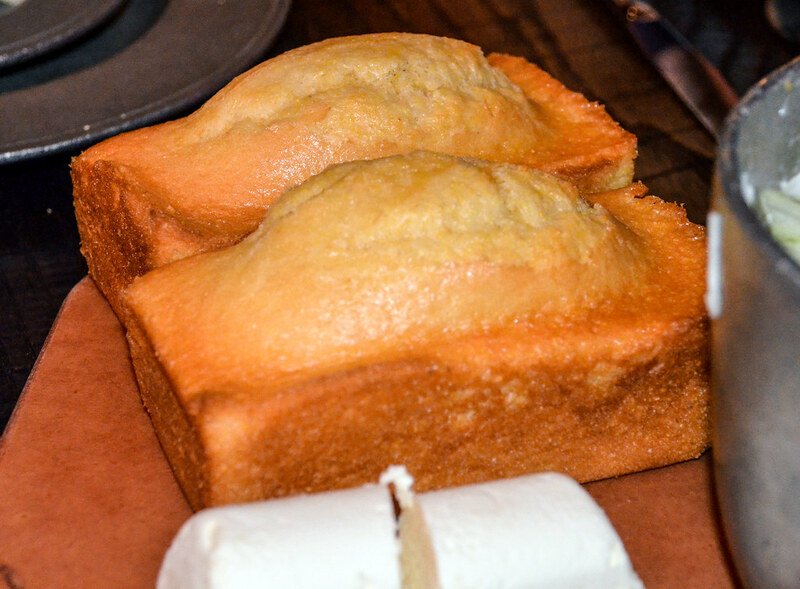 Our meal was started with corn bread, which was moist and delicious. I really liked the flavor here and, while I’m far from a corn bread expert, this is some of the best I’ve ever had. 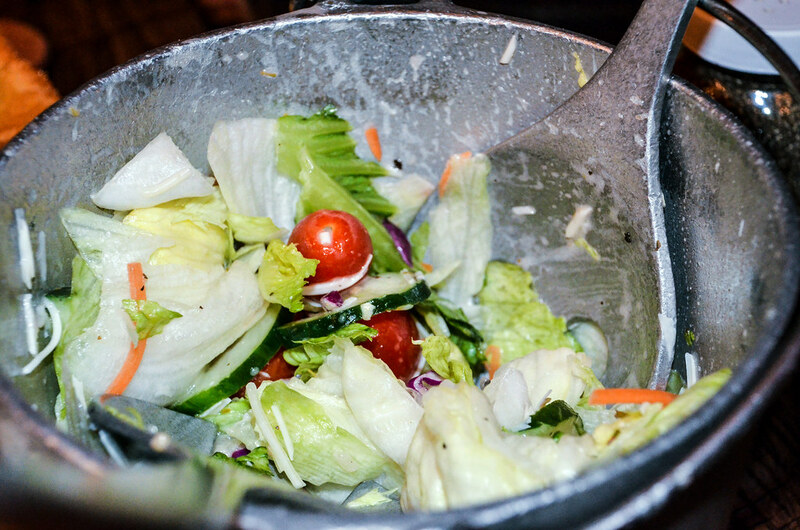 We also were served a salad to start. This was fresh but nothing out of this world. This was a nice break from all of the heavy food that we were about to devour, but I can’t fake much excitement for an average salad. As we were dishing up, the party began as the entertainment entered the room. Along with live banjo and piano musicians, there were 6 actors/singers on the stage, 3 male and 3 female. There was a loose plot to the show but mainly the whole act consisted of old or original songs being played along with a few skits. The plot was a bit confusing because it was about the six actors putting on a dinner show. Very meta? I’m still not sure. Like I said, this is all about fun and if you’re going here for a complex story then you got on the wrong bus. With that being said, even without much story there is a decent amount of character development. One character doesn’t quite fit because he tells bad jokes. One character is a little… uhh.. flirty? One character is full of sass. For only seeing these characters sing some songs and tell jokes, we are able to make a connection to them. That’s something the show does very well. I was also surprised by how well some of the comedy works. Disney often misses the mark on actual comedy outside of a few attractions. 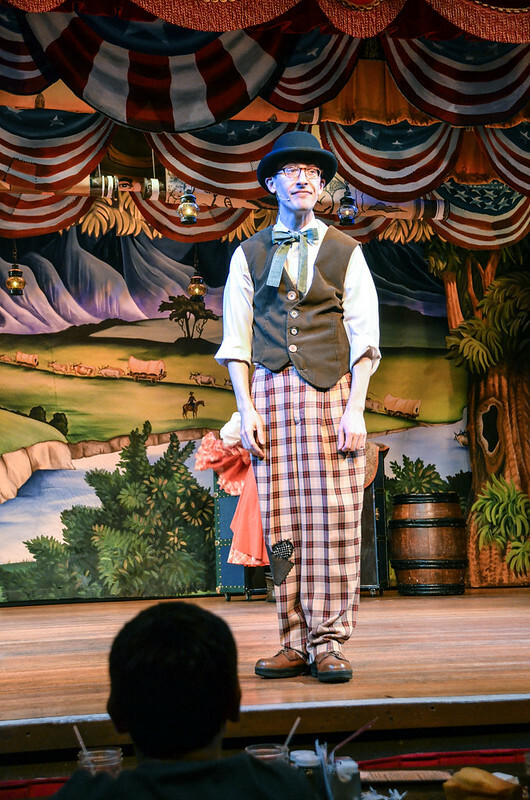 At Hoop-Dee-Doo there is a decent amount of adult comedy. There was nothing over-the-top and the show is very family-friendly but some jokes will go over kids heads and I see that as a good thing. My favorite song (or bit) of the show was when the cast went into the crowd and asked people where they were from. Then they’d come up with a quick verse about that state or city mentioned to fit the tune of the song. I also enjoyed the old standards sung. Most of the music has a country-western or old folk tone to it. If you don’t like that style of music and don’t like comedy very much then maybe this show isn’t for you. But if you tolerate either of those things then I’m guessing you will enjoy the entertainment. One last note about the Hoop-Dee-Doo Revue before we talk more food and overall value is that there is a decent amount of crowd participation. The cast is out with the crowd almost as much as they are up on stage. My dad was one of the main subject’s of teasing. It was embarrassing for him but a lot of fun for us. Not everyone will be teased as rigorously as my dad (very few will actually) but consider this a warning. I don’t think it should keep anyone from going and it just adds to the family environment. 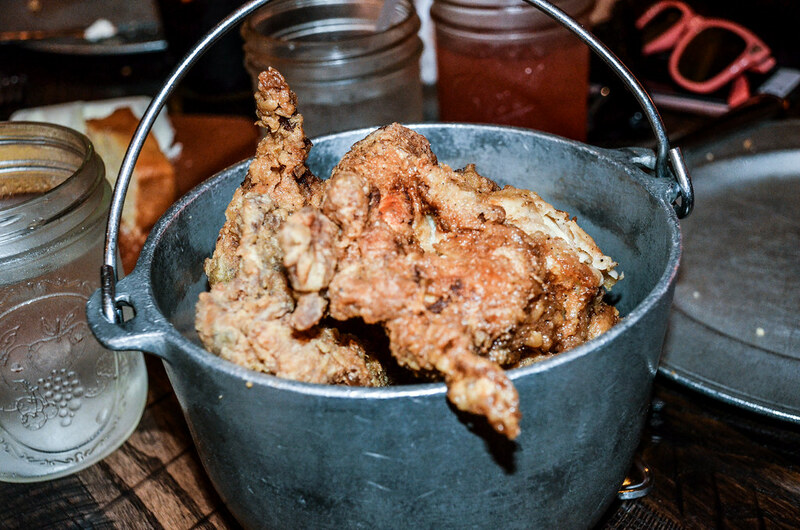 The fried chicken was easily the best item of the night. There was next to no grease on the chicken. The breading was fairly light and full of flavor. The chicken was juicy and delicious. Some of the best fried chicken I’ve had. The ribs were decent. I liked the barbecue sauce pretty well and the meat was juicy. 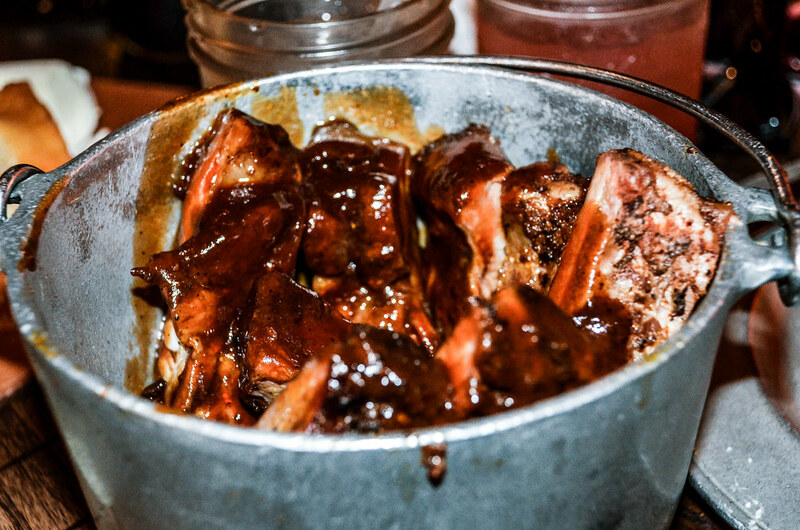 I thought the ribs had a little too much fat on them and the flavor was lacking. I liked the fried chicken far more. Then, there were the sides. I did not like the flavor of the bakes beans at all. The mashed potatoes were pretty average. The corn was buttery and delicious. Overall, I thought the entrée dishes were pretty good, especially considering you could ask for more of whatever you liked. I don’t care to admit how much fried chicken I ate that night. 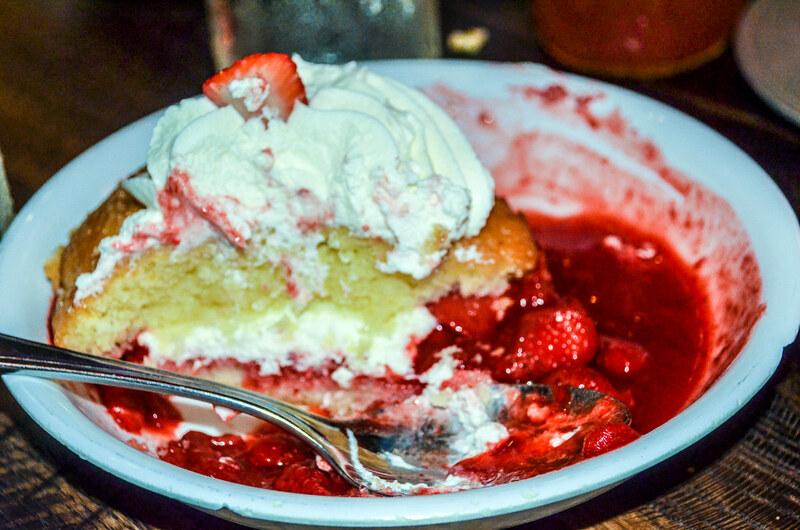 Don’t completely fill up on the main dishes though because there is delicious Strawberry Short Cake to follow. The cake was moist, strawberries fresh and the flavor was great throughout the whole dessert. A perfect way to cap off this homestyle meal. 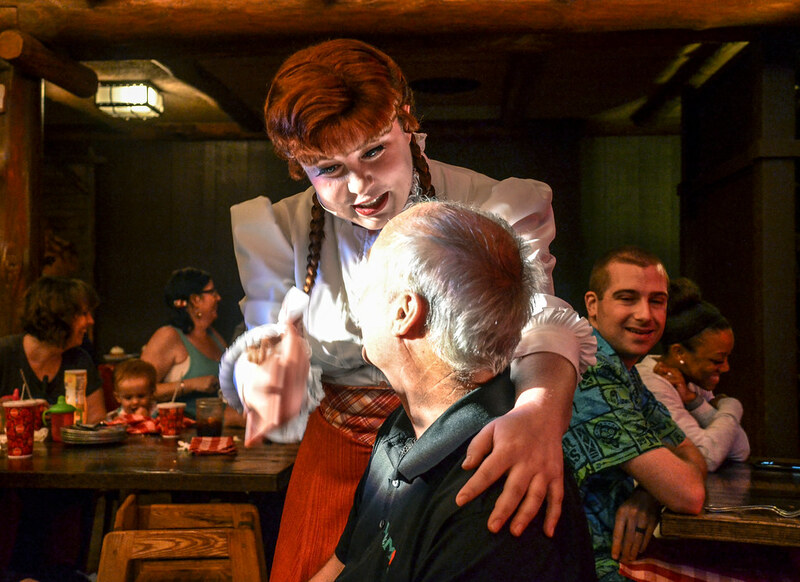 I can’t fail to mention that an evening at the Hoop-Dee-Doo comes with unlimited beer, sangria, chardonnay or merlot. This definitely ups the value of the dinner as alcohol comes at a pretty steep price at Disney. None of the alcoholic beverages offered are particularly high quality. It thought the sangria was decent but far from the best I’ve had. This is probably a big selling point to some and is the most sure way to make this meal worth the price you’re paying. Speaking of price, there are three tiers of seating from $62, $67, and $72. Frankly, if it’s an option, I would just pay the extra for the top tier. Being close to the action is a lot fun and getting stuck in the back of the room or balcony could cause some obstructed views. If you have a a big party, where the extra 5 to 10 dollars could add up, then that’s about the only time I’d consider not paying for Tier 1 seating. 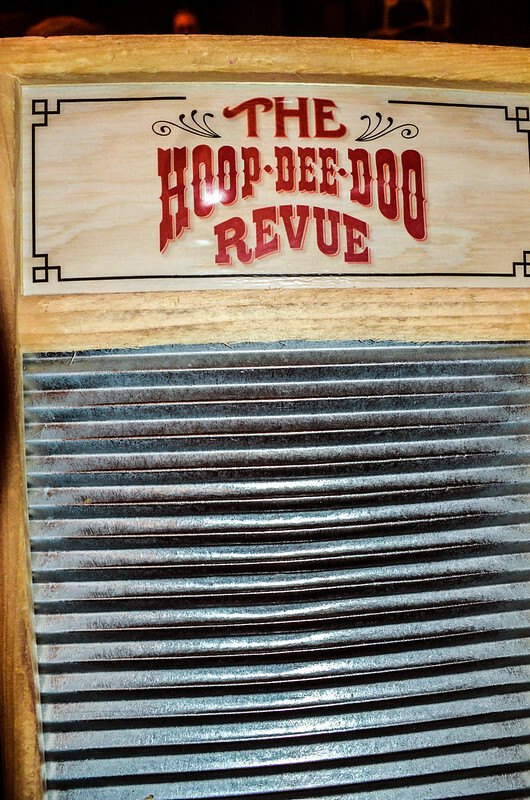 Assuming you paid $72, I think Hoop-Dee-Doo is worth doing once especially if what I described sounds up your alley. If fancy dinners are more your flavor then maybe go for one of those instead but, as a person who enjoys fancy dinners, I was surprised by how much I enjoyed our experience. Now, $72 is a lot of money. I do think the experience is worth doing at least once and overall I would recommend it. For a comparison of Hoop-Dee-Doo being worth the money, let’s take a look at another all-you-can-eat restaurant – Ohana. According to Touring Plans, a dinner at Ohana is $46 for an adult. Now, that is without alcohol but does include soft drinks. I like the food at Ohana better than Hoop-Dee-Doo and would pay about $10 more for just the food there. With that thought in mind, that means, in my case, about half of what I’m paying is for the entertainment and alcohol. I don’t drink a lot so I can’t make up the value like those that enjoy it more than I do. The entertainment is well worth paying for but I’m not sure it’s worth $25 or $30. After breaking it down a little further, I’m not sure Hoop-Dee-Doo offers much value but it is one of those unique experiences at Disney World that every fan who goes fairly often should experience. I don’t know if we’ll go back for the dinner show but I will look back at our experience here fondly. 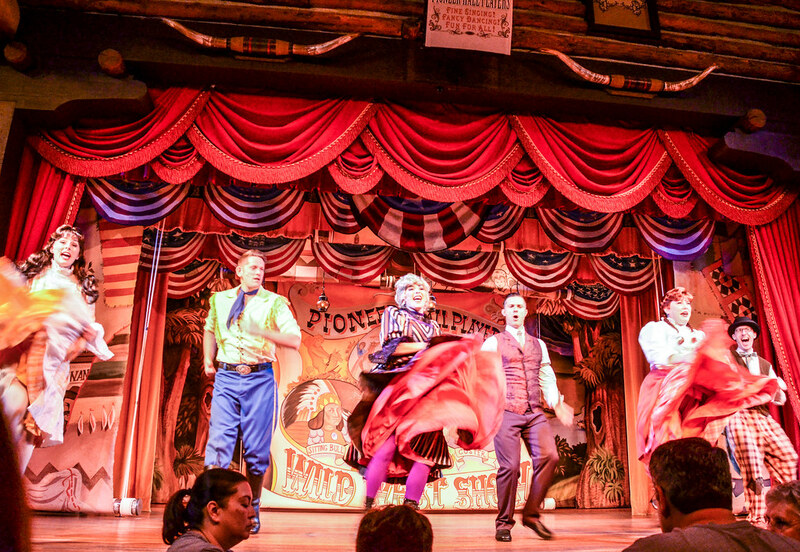 Have you experienced the Hoop-Dee-Doo Musical Revue. Let us know any questions or thoughts in the comments below. If you enjoy what the content here on Wandering in Disney please subscribe to the blog and like our social media pages. You can do both of those things on the right side of this page. Thank you for reading our blog, we really appreciate it!